Sugar content declarations have long been a sore spot for dairy foods marketers because of milk’s inherent lactose content, as a single 8-fluid-ounce glass of 2% reduced-fat milk inherently contains 11 grams of sugar. Here’s the good news. 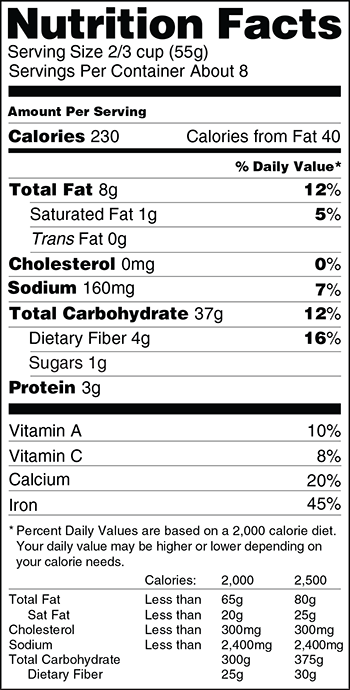 One of FDA’s proposed updates to the Nutrition Facts is the addition of an “added sugars” line. If this gets approved, a glass of milk will look more appealing to sugar calorie counters…as it contains zero added sugars. When it comes to other dairy foods, such as flavored milk, flavored yogurt and ice cream, this proposed update presents an opportunity to reformulate to lower added sugars. It’s being done and there are many ingredient technology opportunities available to assist. More on this later in the blog. 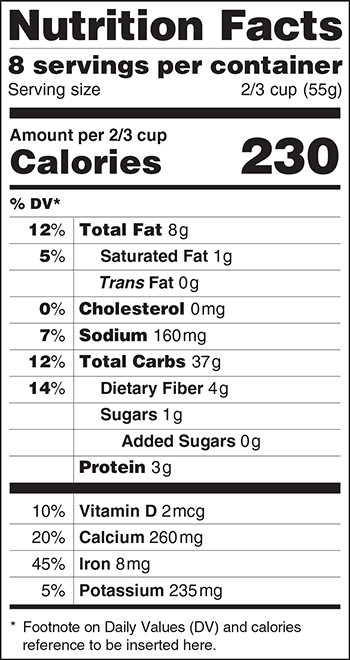 First…in case you missed what went down in Washington, D.C., on Thursday, February 27th, simply, FDA has proposed new changes to food package labels in efforts to make them easier to understand. This is the first major update in 20 years. Under the proposed changes, serving sizes will be made easier to understand. Calories will also be featured more prominently and, for the first time, added sugars will be included. An excellent concise explanation of the proposed changes can be read in Food Business News HERE. If you care to read the more lengthy communication from FDA regarding the proposed changes, link HERE. ABC News, CBS News, New York Times, USA Today and Yahoo News. How do you lower added sugars? All I am going to address right now is that somewhat controversial “added sugars” line. As the primary shopper in a household with a diabetic, and with many diabetics in our extended family, all sugars, but particularly added sugars, are often a deciding factor with many food purchases. My family embraces alternative sweeteners, both those recognized as artificial and those considered natural. The proposed label change will definitely impact my purchase decisions. If you missed the recent Dairy Trends Overview published in IDFA’s SmartBrief on Wednesday, February 26th, you can access it HERE. Lowering added sugars in also trending in the dairy category. This is accomplished by optimizing sweetness through the use of alternative sweeteners, sometimes in conjunction with natural flavors. What are alternative sweeteners? I define an alternative sweetener as anything that contributes the taste of sweet but has less than four calories per gram, which is what you get with sugar and its relatives. This list includes everything from aspartame to sucralose and chicory root to stevia. 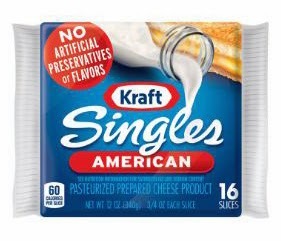 Here’s a product just rolling out that speaks to the “less added sugar” platform of better-for-you dairy foods. 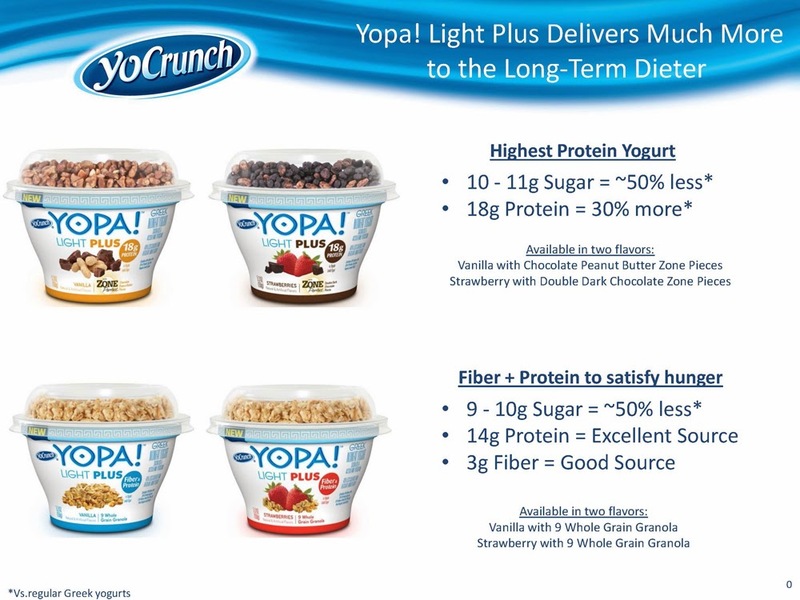 Recently acquired by Dannon, YoCrunch extends its Yopa! 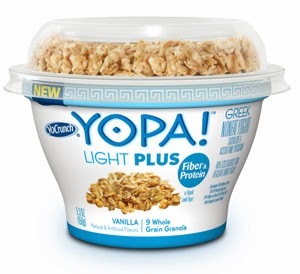 brand with Light Plus Fiber & Protein Greek Yogurt with 9 Whole Grain Granola. 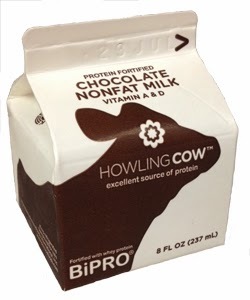 Hitting store shelves this coming week, this product is all about less sugar, fewer calories and more protein. 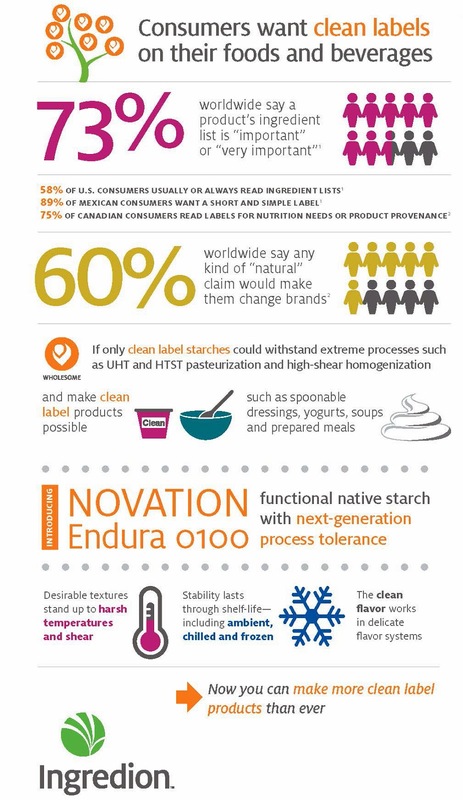 Check out this infographic for nutritionals. 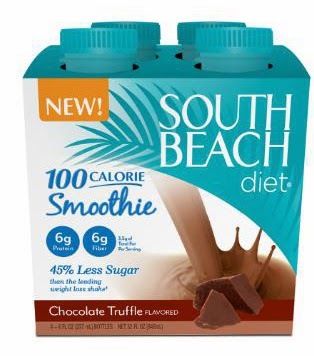 How does this product achieve these sugar and calorie reductions? Some of the responsible ingredients are: acesulfame potassium, chicory root, soluble corn fiber and sucralose. In case you were unaware of some other dairy foods that are all about lower adder sugars, check these out. Dean’s TruMoo brand’s initial mission has always been about lowering added sugars. 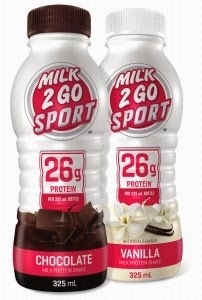 At the beginning of 2013, the brand’s new retail chocolate milk debuted with 35% less total sugar than the leading chocolate milk competitor. It also has 40% less sugar than its previous formula. 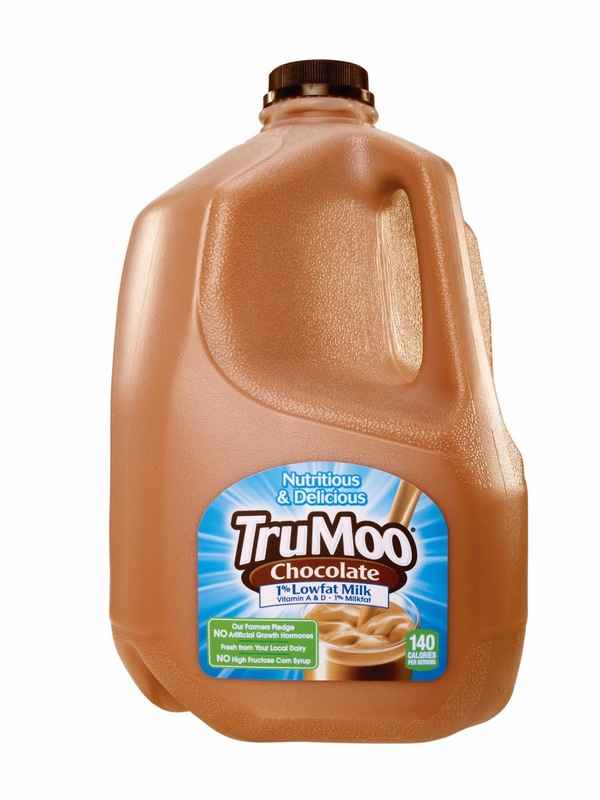 One 8-ounce serving of TruMoo chocolate milk contains just 30 more calories than plain low-fat white milk. Like regular milk, TruMoo provides eight essential nutrients: calcium, protein, vitamins A, D and B12, riboflavin, phosphorus and potassium. This product is just hitting the marketplace. 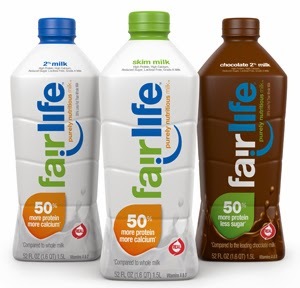 fairlife LLC introduces a high nutrition milk that will raise consumer interest for better-tasting, more nutritious milk products. Introduced to the Minneapolis and Denver regions in early February, “fairlife purely nutritious milk” has 50% more natural protein and calcium and half the sugars of ordinary milk, all while being delicious real milk, with no protein powders. It is also lactose free. The new line of milk, which comes in three varieties, is produced by cold-pressing farm-fresh milk through soft filters to concentrate desired nutrients such as protein and calcium while separating out the fats and sugars. Chobani gets it, too. Have you heard about the 100-calorie cup? 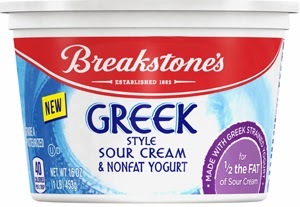 Chobani’s Simply 100 Greek Yogurt is a 100-calorie authentic strained Greek Yogurt made with only natural ingredients. The product comes in six flavors: Black Cherry, Blueberry, Peach, Pineapple, Strawberry and Vanilla. To keep calories at 100, the yogurt is sweetened with chicory root fiber, evaporated cane juice, monk fruit extract and stevia leaf extract. Graeter’s is launching its first significant new product expansion in the ice cream manufacturer’s 144-year history with the introduction of A Little Less Indulgent ice cream. 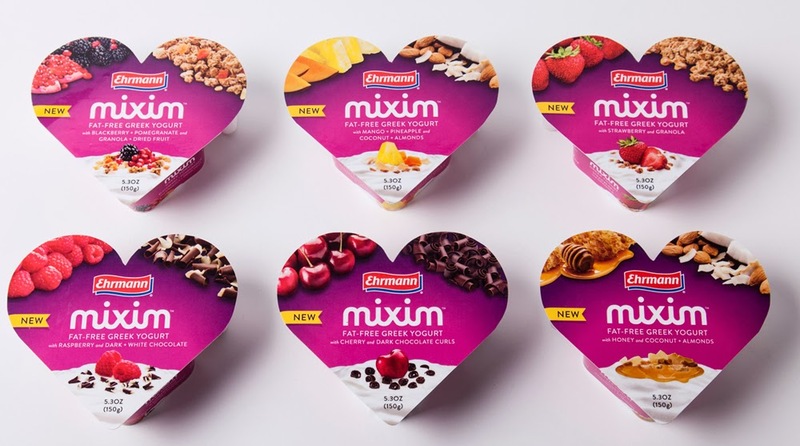 According to the company, the “A Little Less Indulgent” line stands apart from other reduced-sugar ice cream varieties thanks to the sweetness provided by a natural sugar substitute made from monk fruit extract. The sweetener is 150 times sweeter than regular sugar and releases slowly into the body, so blood sugar will not spike. The new line has 50% less sugar and also has roughly 25% less fat and 25% fewer calories than Graeter’s regular ice cream, making it just a little less indulgent while retaining all the flavor of Graeter’s traditional ice cream, according to the company. The dairy foods industry has the tools to create delicious products with fewer added sugars. Let’s show the rest of the food industry we can do it! Even though the temperatures are once again near freezing and more snow is in the forecast, that brief warm-up provided a glimpse to how intense this summer is going to be. No longer will we take warmth and sunshine for granted. Every minute is to be savored. And ice cream is a very important part of summer-time fun. In January I blogged on “Ice Cream Trends 2014.” You can view this blog HERE. My predictions have been republished in dairy magazines around the world and I have received much feedback from ice cream entrepreneurs who want to share their soon-to-be released innovations that support my predictions. Many are still embargoed, so stay tuned. Some are showcased in this blog. This blog builds on my predictions made in January. Those predictions are supported by a number of recent product introductions. #1. I think chocolate ice cream lovers have grown tired of all the salty caramel variations that had stolen freezer space this past year. They must have created some secret online petitions to get ice cream marketers to once again put chocolate on the menu because chocolate is once again in the spotlight. I previously predicted that chocolate in ice cream should be premium, fanciful and even fairly traded. This should be called out on product labels. And combining chocolate ingredients will become increasingly popular. Some of the same is true for plain old vanilla, which is my favorite. As with all flavors used in ice cream, in this day and age of clean-label formulating, it is best to use natural flavors, especially vanilla. When you can identify the source of vanilla, call it out on the package. This is exactly what you get with Choctál, a line of indulgent, ultra-premium ice creams made with the world’s finest single-origin, sustainably sourced vanilla and chocolate ingredients. 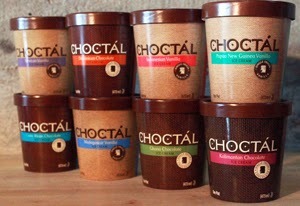 Choctál ice cream products are made using chocolates and vanillas grown around the world, allowing consumers to experience unique and distinct flavor profiles. Much like how estate-grown wines vary greatly depending on the characteristics of the different climates and soils that they grow in, the same is true of chocolates and vanillas grown in different countries. Each of the eight flavors made by Choctál is unique in both color and taste. The four chocolate varieties are: Costa Rican Chocolate, Dominican Chocolate, Ghana Chocolate and Kalimantan Chocolate: Dark and intense; finished with the slightest touch of caramel. The four vanilla varieties are: Indonesian Vanilla, Madagascar Vanilla, Mexican Vanilla and Papua New Guinea Vanilla. 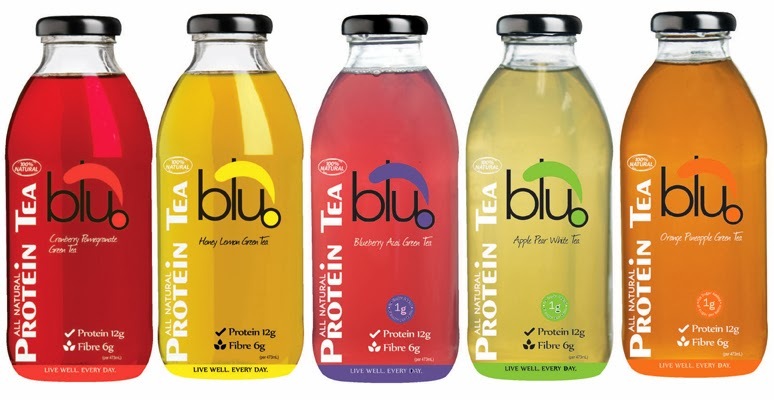 The products come in pints and 4-fluid-ounce single-serve containers. All the formulations are gluten free and egg free without any artificial additives, according to the company. #2. More and more and more chocolate, the chocolate story continues. White, milk and dark chocolate are being combined in many ways, shapes and forms in ice cream. 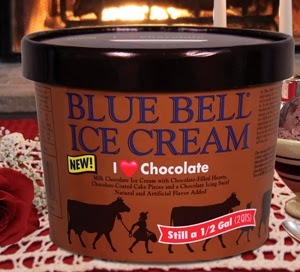 Just in time for Valentine’s Day, Blue Bell introduced a true chocolate lover’s delight! I (heart) Chocolate Ice Cream is chock-full of everything chocolate. This limited-edition flavor is smooth milk chocolate ice cream combined with dark chocolate-filled chocolate hearts, chocolate-coated cake pieces and a chocolate icing swirl. 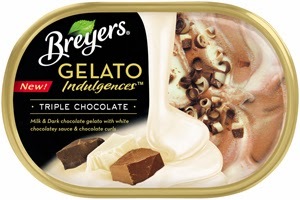 Triple Chocolate is also one of four flavors in Breyers’ new gelato line. This variety combines milk and dark chocolate gelato with white chocolate sauce and chocolate curls. #3. That brings us to my third ice cream insight: Gelato. This premium ice cream concept will continue to grow. Read more about the gelato trend HERE. The three additional varieties in the new Breyers line are: Raspberry Cheesecake (cheesecake gelato with raspberry sauce and graham crumble), Tiramisu (mascarpone gelato with espresso sauce, ladyfinger cookie pieces and cocoa) and Vanilla Caramel (vanilla gelato, caramel sauce and caramel curls). Graeter’s recognizes the opportunity in gelato and is right now launching its first significant new product expansion in the ice cream manufacturer’s 144-year history. The new gelato line resembles authentic Italian-made product, according to the company. 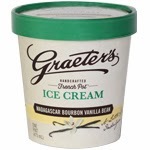 The secret to its authenticity is Graeter’s French pot process, which uses the same old-world freezing process used by Italian gelato machines. The method prevents air from being whipped into the product and also restricts the producer to make it in small batches, which is a requirement to be an authentic gelato. Gelato traditionally has significantly less air than typical American ice creams and only half the butterfat content of super-premium ice creams. 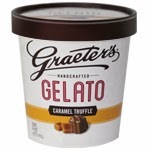 Graeter’s gelato flavors are: Caramel Truffle, Hazelnut Truffle, Vanilla with Dark Chocolate Truffles and Vanilla with Milk Chocolate Truffles. “Graeter’s has focused solely on hand-crafting our super-premium ice cream for four generations, and we’ll certainly continue to serve to our tried and true fans, but we’re excited to open the door to new customers and experiences with our gelato line,” says Richard Graeter, CEO of the 4th generation, family owned company. #4. Here’s a trend that I have not spoken to directly for ice cream, rather for dairy, in general. It’s gluten free. Just like lactose free, I have always said, if you can make the claim, then make it. There’s a growing number of consumers trying to avoid either or both, for real or perceived health reasons. Of course, in ice cream, lactose free is a bit more complicated, but with the addition of lactase enzyme to the milk prior to processing, it is possible. Gluten free is much simpler, especially with most plain and simple clean-label formulations. As mentioned, Choctál is gluten free. 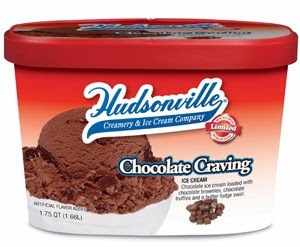 So are a number of Hudsonville flavors. The latter brand recently had a makeover and the new easier-to-read packaging includes a gluten-free call out on flavors that meet the criteria for the recently defined content claim of gluten free. To read more about gluten-free claims, link HERE. 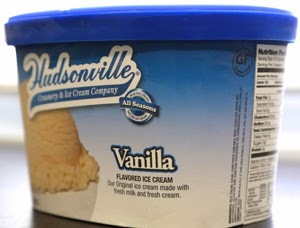 For Hudsonville, gluten-free labels are clearly visible on many flavors, including Vanilla, Michigan Deer Traxx, Mackinac Island Fudge, Triple Peanut Butter Cup, Grand Traverse Bay Cherry Fudge and a flavor launched at the end of 2013, Toasted Coconut. “We are thrilled to highlight the fact that so many of our flavors are naturally gluten free as we know that is going to be a huge bonus for the one in 133 people in the U.S. who have celiac disease and the even greater number, around 6% to 7% of the population who are gluten sensitive,” says Beatty. #5. Fruit ices and sorbets are typically gluten free and lactose free, which is contributing to the revitalization of this category. When made with real fruit ingredients, these products are especially attractive to the health and wellness consumer. S.R. 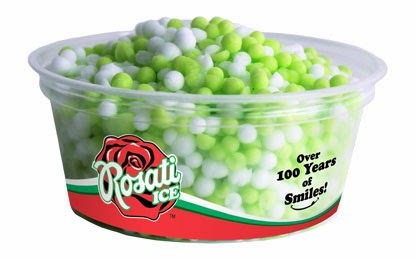 Rosati is introducing a pelletized ice product through a joint venture with Kemps. Made using a cryogenic freezing process, Cry Baby Teardrops are sour cherry ice pellets and Typhoon Raindrops are lemon lime. The company also plans to bring back its highly successful party pails, which were launched in summer 2013 in a 4-quart size. For 2014, the pails will also be in a more convenient (for small freezers) 2-quart size. 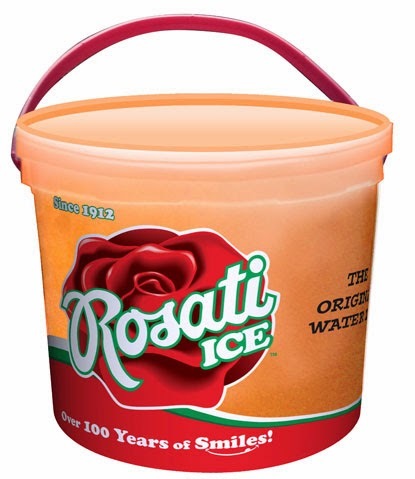 Rosati Party Pails come in four flavors: Classic Cherry, Classic Rainbow (cherry, blue raspberry and lemon), Mango and Root Beer. Rosati Ice is known for its recipe that allows the Italian ice to remain scoopable even at really cold temperatures….but not as frigid as what Chicago experienced this winter! This leads me into the two final ice cream insights for this blog: Better-for-you and less-sugar. #6. 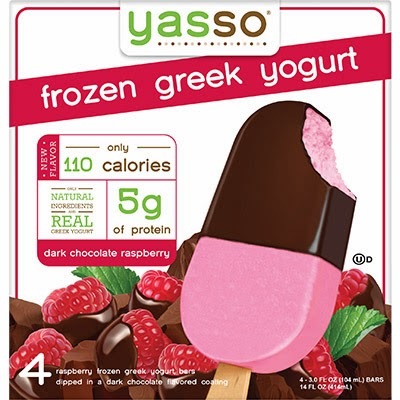 Better-for-you frozen desserts are often not Standard of Identity products, as the addition or omission of certain ingredients does not allow it to be legally called ice cream, at least in the U.S. That’s what makes these products so special, especially when they deliver on taste, texture and nutrition. This is the case with Naturally Smart, a product that was first produced in October 2013 in 3-gallon containers for foodservice by its namesake company based in Jacksonville, FL. The company’s first wholesale run was in November 2013, and as of this past Wednesday (February 19, 2014), pints of the product are available in the Jacksonville Whole Foods Market. “The response has been amazing,” says Mark Patterson, president of Naturally Smart. The company plans to grow nationally and add new flavors (coffee, coconut and green tea) to the line, which debuted in chocolate and vanilla. 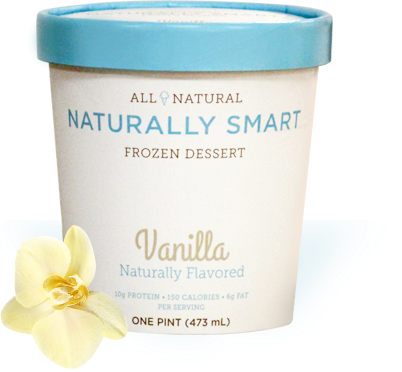 Naturally Smart is a frozen dessert that’s a healthier alternative to ice cream. To label something as ice cream it needs to have at least 10% butterfat and a certain amount of milk solids, according to Patterson. “The fat content of Naturally Smart is lower, at about 6%. Our lower fat content and the fact that we don’t have the required level of milk solids means that we can’t call Naturally Smart ice cream, so that’s why we call it a frozen dessert. “Naturally Smart is a good source of protein (from the addition of whey protein concentrate), and that’s the whole point of it,” he says. “It’s also all natural--made with milk, cream and natural sugar. Some people wanted me to use corn syrup or artificial sweeteners but it was important to me to be as natural as possible with all our ingredients. #7. Lucky number seven! The lower-sugar ice cream segment has experienced peaks and valleys over the years. 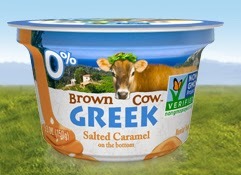 Graeter’s new product launch includes a reduced-sugar line using monk fruit extract. The “A Little Less Indulgent” line will be featured this week as a Daily Dose of Dairy…stay tuned. Another unique concept comes from Belgium. This frozen dessert relies on stevia for sweetness. It, too, will be featured as a Daily Dose of Dairy very soon. Not a subscriber, you can subscribe HERE. In conclusion, artisan ice cream manufacturers continue to support the phrase: expect the unexpected. Here are some innovations that Portland, OR-based Salt & Straw, which is known for featuring the state’s famous berries, vegetables, meats and cocktails through unimagined ice cream flavors, will be scooping this summer. Want more scoop on these creations? Visit HERE.